I must’ve missed September. I can’t imagine how it’s already October. We have been in a huge detox mode here at my house. Maybe that is why I feel I missed it, too busy. I’ve been working my way through closets and drawers and cupboards. I’ve also made a commitment too use up any excess we have in the pantry, freezer and toiletry cupboard. I’ve always had spare this and extra that. It has gotten excessive. I think it’s is because we have such a large family I needed to have a lot of back stock. Like shampoo. When 7 people are showering in one bathroom you go through so much of it that having only one back up meant I might not have time to get to the store before we were well into the back up bottle or even completely out. But now, we are so few living at home and we have 3 showers it takes forever to use up a bottle, I hardly need to have a back up, let alone more than one. Hence the rethinking. And the sorting. As a plus, I haven’t seen the inside of a Target since at least August. As I’m spending a portion of my free time clearing out things I’ve got less knitting time. I’m working on all the same projects and I’ve started a few new ones. As I went through my closest I decided to make the lifestyle choice of only wearing sweaters I hand knit. I donated all my store bought sweaters and am determined. Therefore, I started a sweater for myself. My daughter, Hanna, also started the same sweater for herself; so we are having a KAL. 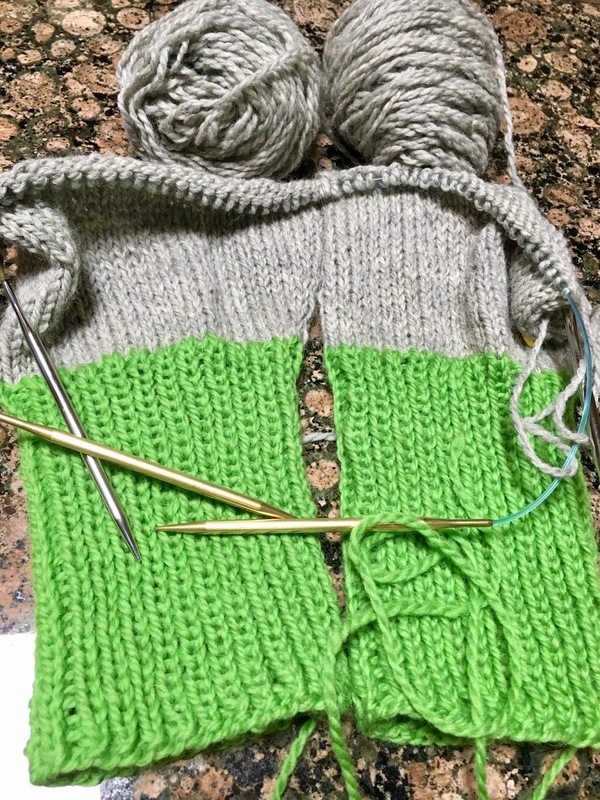 We are knitting the Louise Cardigan by Carrie Bostick Hoge. I really like the simplicity of the design and the playfulness of the colors. I’m quite aways into the sweater and I really like the yarn and the gauge I’m getting. I’m using Cascade Eco Plus wool. It is one of my go to yarns. I’ve found the Louise Cardigan to be somewhat challenging. I’ve made pretty good notes of what I did and hopefully can explain to Hanna so her first hand knit sweater goes smoothly. The pattern has some omissions on important parts and directions that aren’t very clear. I’m particularly frustrated because I purchased this pattern for $7, I feel that if a pattern is being sold there is an expectation of clear instructions and any errors get caught through test knitting and proof reading. I looked through Ravelry at all the notes other knitters made while making this. I didn’t see anyone else having too many issues so it is possible I’m the one with the problem and not the pattern. Here’s a link to my project notes. Another new project I started is the Mitten Garland Advent Wreath by Kathy Lewinski. 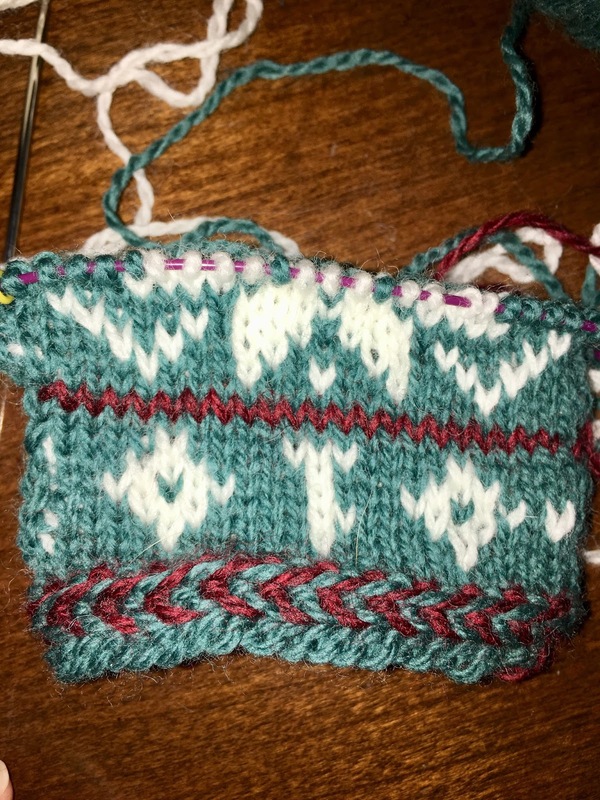 I am not very good at color work, Fairisle, so I thought this would be a great way to brush up on my skills. 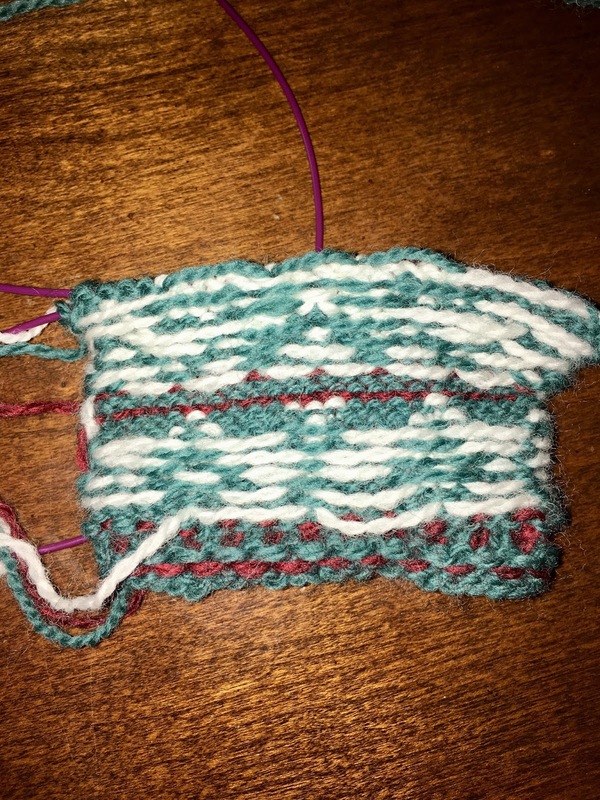 I’m using Knitpicks Palette yarns. I grabbed two different color packs. Peppermint Icicle and Herbal Wreath. I’m using a 47″ #0 circular needle for magicloop. It’s a slow process. I’ve knit and ripped out the first mitten no less than 7 times trying to get my tension even. I think I’m there but it really requires a lot on mental concentration. Like, nothing I’ve knit in awhile. It’ll be interesting to see if my speed and focus catch up to my usual level. I’m not sure if I’ll get all 24 knit, for sure not for this Christmas! Today I filmed a video about knitting the Heel Turn section of a sock. If you want to check it out here’s the link. 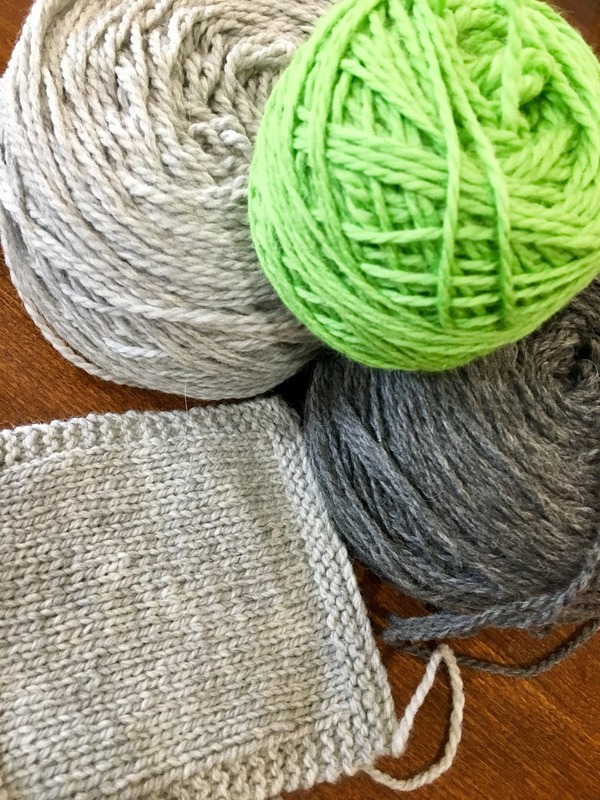 I get a lot of questions from new sock knitters regarding the gap in this section like what do I mean “The Gap?” so I hope this is helpful.